Submitted by Norm Roulet on Mon, 04/26/2010 - 06:00. The Greater Cleveland Lead Advisory Council has released data on children in the neighborhoods of Cleveland and surrounding suburbs who were tested and documented as lead poisoned in Cuyahoga County in 2008 - about 3,200 of our Cleveland children were KNOWN to be lost to lead poisoning - about 4,000 children poisoned in Cuyahoga County overall. As only a small percentage of our children are actually tested for lead poisoning, the numbers of children in the County lost to lead poisoning is much higher... 1,000s of victims higher. Cleveland's worst known mass-murderer, Anthony Sowell, is only known to have killed 11 people.... yet that has captured 1000s of inches of pointless newsprint... hours of pointless news coverage... to help nobody. Lead poisoning is barely ever mentioned in mainstream media as a problem in this highly contaminated region - raising awareness of this would help save 1,000s of children from lifetimes of suffering and lost opportunity for normalcy. As such, the mainstream media is complacent if not conspiratorial in these 1,000s of poisonings. The leadership of these media organizations are personally responsible for this harm caused to citizens, who support the media by buying their flawed products. For shame. The politicians responsible for the lead poisoning of over 4,000 children per year are far more serious criminals, yet they are not prosecuted for their crimes. I expect they shall rot in hell, but that may be difficult to prove. What is easy to prove is that in communities with competent leadership lead poisoning is entirely preventable. Northeast Ohio has horrible leadership, and has for long enough to have poisoned 100,000s of our children, and destroyed our public health and economy.... all to help the interests of a few people who were responsible for covering the Earth in lead, and their lawyers. If You Are A "Politician" In Northeast Ohio Not Committed To Lead Poisoning Eradication, You Must Resign. There is considerably more lead poisoning data you never saw before linked as attachments below - look up your neighborhood and then your political leaders and thank them for killing our children and economy - or attack them for that... your choice, citizens. I'm attacking them for lead poisoning my family until they are ALL GONE, and lead poisoning is truly eradicated here for all, forever. The current local standard of 5mg/dl to indicate lead poisoning is still way to high, and no amount of lead is safe or normal in a child's body - average ambient childhood lead poisoning levels should be well below 1mg/dl, as caused from broad environmental pollution alone. Anything higher is the results of source point dangers in the child's personal space, and preventable with good community awareness and activism. We have not had good community awareness and activism about lead poisoning here, and you see the results, as real as may be. Our political "leaders" should stop wasting citizens' time and money trying to fix the education and crime problems here, if they aren't serious about solving our greatest crime... the lead poisoning of 1,000s of our children. No more elections shall pass without the candidates addressing this issue, if I have my say at the table. If you don't want to address the harm lead poisoning causes our children, do not run for political office in Northeast Ohio, or to represent us at any level of government, to the White House. Submitted by Norm Roulet on Mon, 04/26/2010 - 06:12. And the "Sustainabillies" here know what I think of them for saying all this lead poisoning is sustainable... same goes for the local academics, economists, and planners neglecting to address this problem... you are all responsible for these lead poisonings and should move on to less life-critical work where there are not real world concerns to address. You are dreamers creating nightmares. Submitted by Norm Roulet on Mon, 04/26/2010 - 06:26. It enables 1,000s of lead poisonings a year. Submitted by Norm Roulet on Mon, 04/26/2010 - 14:26. I feel good about one aspect of the current lead poisoning situation in Northeast Ohio ... it is so bad for so many people that I have found since I have raised awareness of this issue on realNEO - especailly with first hand experiences with my lead p[oisoned children - I have more adults I know voicing concern about this crisis with regards to their own personal health, and the health of their children - when people are truly informed about this crisis, THEY DO REACT. Hence the conspiracy by Jones Day, Peter Holmes and their cohorts to disrupt realNEO and prevent people from becoming informed about lead poisoning. Hence my parents concern about my family being in danger, because I appear to be the sole activist in the region concerned with lead poisoning, as people who will lead poison 1,000s of children will kill outright, without a doubt. If you call that paranoia, you may talk to my psychiatrist father about your lack of connection with reality... there may be a drug to help you. Submitted by westward on Mon, 04/26/2010 - 17:27. Norm, you have lived and breathed lead poisoning for a while. You were on the committee to review and have networked intensively on this issue. Most people, including me, do not know all of the ins and outs of this. We don't know what you mean when you say "Hence the conspiracy by Jones Day, Peter Holmes and their cohorts to disrupt realNEO and prevent people from becoming informed about lead poisoning." Please don't blow me off by saying that the ones that are doing this know what you mean, because they are a lot of people who read this. It would be helpful if you would remember that most readers are not in the loop. We all have a focus on different issues that impact our families and community, and other issues do not receive the scrutiny that they deserve because there are so few hours in a day. So, in the end, I am not saying dumb it down for us readers, but explain what you mean in some of these statements so that people get a clue. An example is the statement that I copied and posted. Tell realneo readers what "Jones Day, Peter Holmes and their cohorts to disrupt realNEO and prevent people from becoming informed about lead poisoning." Submitted by Norm Roulet on Mon, 04/26/2010 - 18:02. Submitted by Norm Roulet on Mon, 04/26/2010 - 20:18. Now look at this map and consider where we burn coal here, which releases lead into the environment, which settles into the landscape, and consider, where the winds blow, and where there is geography that influences the flow of air and pollution, and where there are the highest lead poisoning levels, and I believe you will find a correlation. We must test, measure and map much more to determine specifics of the relationships between coal burning facilities and lead poisoning here. Submitted by Norm Roulet on Mon, 04/26/2010 - 21:45. 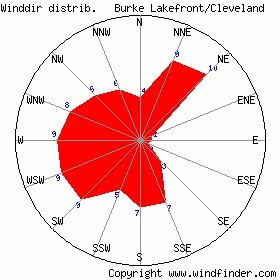 Your Handy Burke Lakefront Annual Wind Direction Chart. The wind is coming from the red areas, by percentage - consider wind direction compared to where there are major coal burning facilities compared to where there is significant lead poisoning (and where you live, for that matter). Of course, different months have different concentrations of pollutants and different wind directions - those living near pollution sources should monitor wind constantly, to know when their neighborhood is most exposed, to at least try and keep the contamination out of their homes. Government should make that easy for citizens. Submitted by Charles Frost on Thu, 04/29/2010 - 22:35.